No, Lunapalooza is not a typo. The Adler Planetarium is celebrating the total eclipse of the moon late into the night of Jan. 20 with Lunapalooza and Writers Theatre is celebrating Martin Luther King, Jr. Day with a free Civil Rights production Jan. 21. Pretty much every time our universe puts on a sky show, the Adler celebrates by sharing its astronomers and equipment. During the solar eclipse last August, the Adler was handing out the proper sunglasses and had a companion craft activity to safely watch the event. 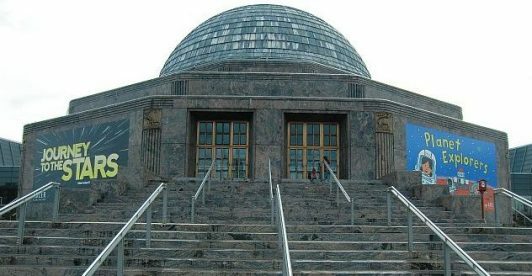 For the lunar eclipse the night of Jan 20, Chicago’s world-class planetarium is celebrating with a free outdoor experience, no telescope or glasses needed but PJs are OK because the event goes from 8 p.m. to midnight. But there’s a lot going on inside. With the admission pass of $14 adults and $8 children age 3 to 11, guests can go to “Eclipse HQ” in the Space Visualization Lab which has a live feed and chat opportunities with astronomers. The pass also is good for seeing the Adler’s new show, Imagine the Moon that opens Jan. 18 and charts how the moon was part of people’s lives through the ages. Indoor activities include a glow-in-the-dark PJ party in the Family Zone and grabbing a cup of hot chocolate before going outside to witness the event. There are more things to see and do so go to Lunapalooza. To find out how to get tickets go to Adler Planetarium shop. To learn more about Adler’s new show visit Imagine the Moon. The Adler Planetarium is at 1300 S. Lake Shore Drive, Chicago. Produced by Writers Theatre, the annual, one-person- show written by Yolanda Androzzo and featuring Angela Alise, will be performed free at the Chicago History Museum Jan. 21, 2019 at 10:30 a.m. The Chicago History Museum is at 1601 N. Clark St. and Lincoln Park. The hour-long show will be followed by a discussion. Writers Theatre takes the show, a meshing of interviews of Chicago-based Civil Rights activists with poetry and hip-hop expression that is directed by Tasia A. Jones, to 35 Chicago Public Schools, community centers and juvenile detention centers during a 6-week tour. The production can also be seen earlier at Writers Theatre, 325 Tudor Ct., Glencoe,on Feb. 2 at both 4 and 7 p.m. Those tickets are Adults $20, students $10. They are available by calling (847) 242-6000 and at WritersTheatre MLK Project.